When my husband and son signed up for an Easter holiday football trip, my 18 year-old student daughter and I knew what we had to do – book a trip ourselves. 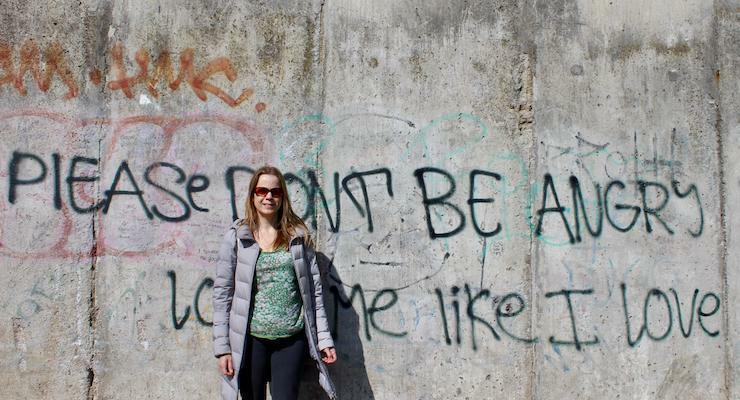 My daughter’s favourite place from InterRailing last summer was Berlin. As I’d never been there, we decided that this was where we should go. My daughter’s vegan and I don’t eat meat, and everywhere that we ate on this trip was a place that she’d found through her research. I’d recommend all of them. This is what we did (and where we ate) on our three-night trip. After a horribly early start (we left home at 5am) our London Gatwick flight arrived to sunshine at Berlin Schönefeld at 10.30am. We were travelling with hand luggage only, so were soon out of the terminal and in to the train station to catch a train to our hotel. 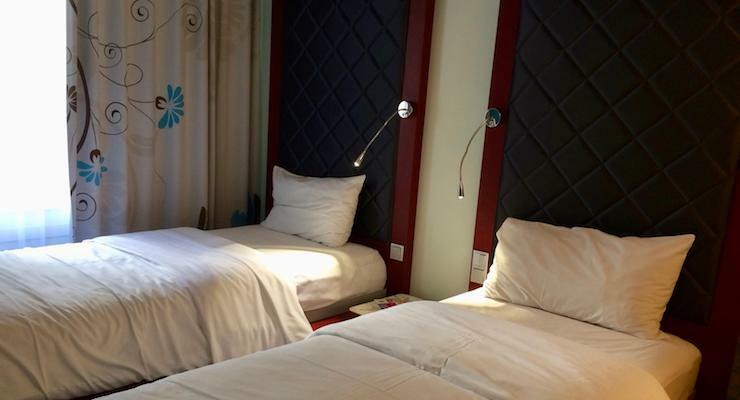 Our hotel, the four-star Ibis Styles Mitte, was right next to Rosenthaler Platz station in the city centre. As our room wasn’t ready until 3pm, we left our luggage at the hotel and went to find lunch. We also picked up our Berlin WelcomeCards which had been left at the hotel for us by the Berlin tourist office – the cards give free travel on public transport as well as discounts on attractions, and so are very useful. We had lunch at Daluma, on Weinbergsweg, just around the corner from our hotel. The food was wholesome, healthy and delicious. From there we walked to AlexanderPlatz to take a sightseeing tour on an open top double decker bus with Berlin City Tour. Our Berlin WelcomeCards gave us a discount on the tour tickets. It was relaxing to be driven around in the sunshine, looking at the sights, but the commentary was via an audio guide, which was slightly frustrating as it wasn’t always clear what was being talked about. I think that I definitely prefer tours with a live guide. Anyway, we saw the Reichstag, Berlin Wall, Brandenburg Gate, Checkpoint Charlie, TV Tower and lots more besides, and it showed us the scale and size of the city. Berlin’s a big place, too big to explore on foot if you have limited time. Back at the hotel, we checked in and went to relax in our room (number 223). It was a twin en-suite room at the back of the hotel, and it was very quiet. The room was compact but comfortable and clean, with bright modern furnishings. The hotel has free wifi for guests, and provides free tea, coffee (including decaf) and water in reception. There was no kettle or safe in room. I put our passports in the safe at reception while we were there. We had dinner at Shiso Burger, an upmarket gourmet burger place which is a 10-minute walk from the hotel. We both opted for a Toad Burger, which is mushroom and salad in a bun, with chips. We had breakfast at the hotel (there’s a decent self-service buffet breakfast for all guests) and then set off to explore Berlin. It was a sunny day and we walked from the hotel to Gedenkstatte Berliner Mauer (Berlin Wall Memorial), the main memorial site to the wall which divided the city from 1961 until 1989. The memorial stretches along 1.4 kms of the former border strip, and includes a section with all of the layers of defence in place, which you can view from an observation tower. There’s also a long section of wall interspersed with metal spikes representing missing parts of the wall, and information points in English and German as you go along. It’s a very interesting place, and is free to explore. As it was outside, it didn’t feel crowded or touristy. The information centre was closed as it was Monday when we visited. We travelled from here by underground train to the DDR Museum, which is all about life in East Berlin under the control of the former Democratic Republic of Germany and is fascinating. Highlights include a re-creation of a fully-furnished East German flat, sections about travel (including the popularity of nudist camps and beaches as a from of rebellion), music, dancing, cars (there’s a Trabant to ‘drive’), shopping, the media, education, and more. There are many interactive exhibits and we used our WelcomeCards for a discount on our entry tickets. We had lunch at Dean and David, a swish sandwich bar a few minutes’ walk away on Karl-Liebknecht-Strasse. From here we walked to Bebelplatz to find the Book Burning Memorial at the place where Nazi-supporting students burned around 20,000 books in 1933 in a literary purge against ‘un-German’ writers. My Dad had told me about this historic place, and I wanted to see it for myself. The memorial is hard to spot as it’s under plate glass below the square. As you stand beside the glass and look down you see a room of empty, white bookshelves. The glass is quite reflective so you see yourself and others standing on the ground as well as the shelves below. The piece is by Micha Ullman and is called Library. We then got an underground train to Kochstrasse to see Checkpoint Charlie. 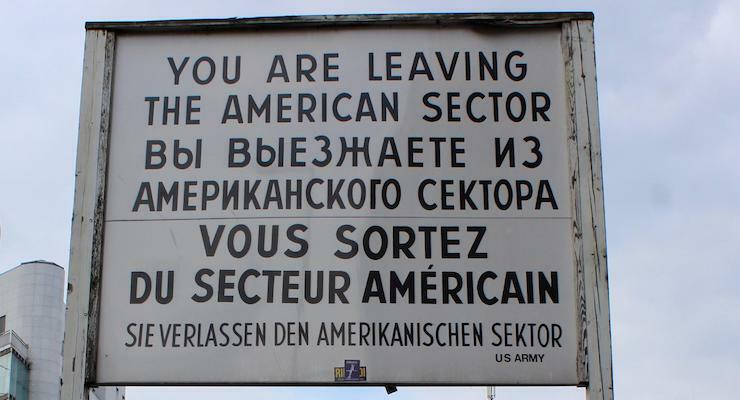 This was a crossing point between East and West Berlin during the Cold War. It was very busy around here and it felt quite touristy. There was a guy dressed up as a US soldier holding a US flag by the checkpoint, asking for people to pay to have a photo with him. We didn’t stay there for long, and then walked to the Topography of Terrors. 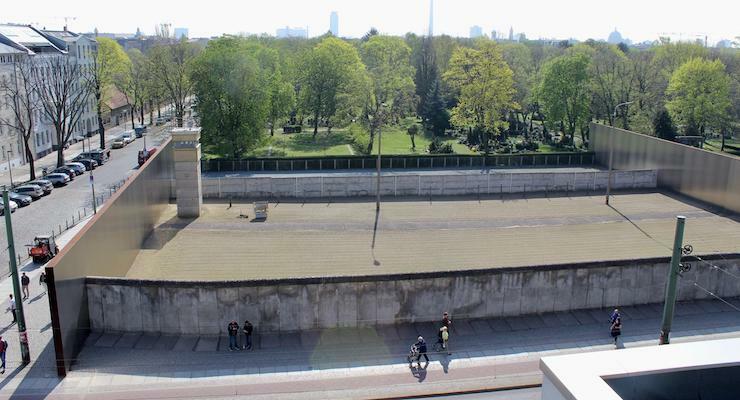 The Topography of Terror is a free museum on the site of the former Gestapo and SS headquarters. It tells the story of how Hitler rose to power, the persecution of Jews and other people by the Nazis, the invasion and occupation of other countries, what happened to Nazis at the end of the war, and more. There’s a lot to take in, but it’s important to read about what happened. The displays are in German and English and there are many photos and copies of documents to see too. After visiting this museum we went back to the hotel. Momos is a tiny restaurant which specialises in organic vegetarian dumplings. It took us about 10 minutes to walk there from our hotel. We sat at one of the three tables inside and ordered the Momo Experience to share – a mixture of steamed and pan-fried vegan dumplings with dips, cooked to order, for 13,90 euros. It was all very tasty, and just the right amount of food for us. After breakfast at the hotel we took the underground to the Reichstag. The weather was a lot colder than the day before, and the sun was covered by grey clouds. 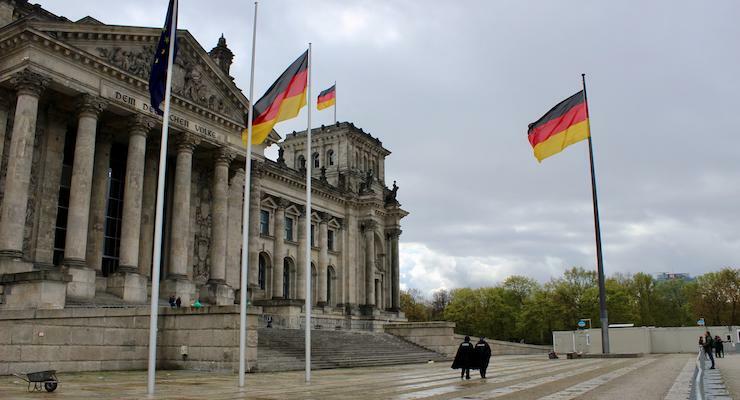 It’s possible to go on a tour of the famous Reichstag parliamentary building, but to do so you need to register and book online in advance, ideally weeks before your trip. We hadn’t done that, so we went to see it from the outside. It’s a monumental neoclassical building topped by a modern glass dome, designed by Sir Norman Foster. I’ll have to go back to Berlin another time to see it inside. 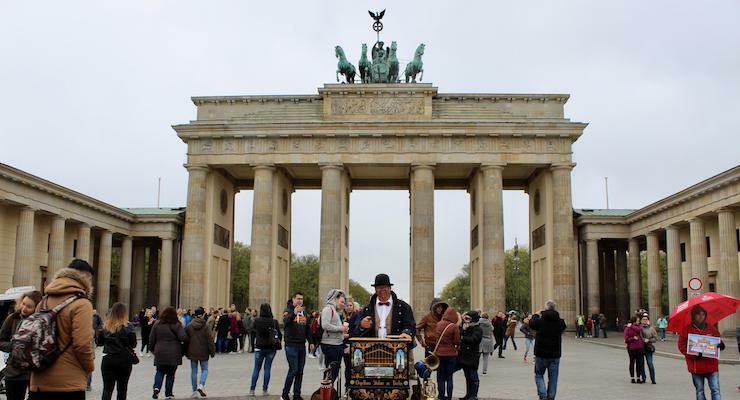 A few minutes’ walk away is another iconic, monumental German structure: the Brandenburg Gate. The gate opened in 1791 and has come to symbolise freedom. In 1989 it was opened as a border crossing by leaders of East and West Germany. There’s a Room of Silence inside the gate, where you can sit in contemplation. I liked this room, but my daughter couldn’t get out of there fast enough, eyes rolling. From here we walked for five minutes to reach the Memorial to the Murdered Jews of Europe, commonly known as the Holocaust Memorial. 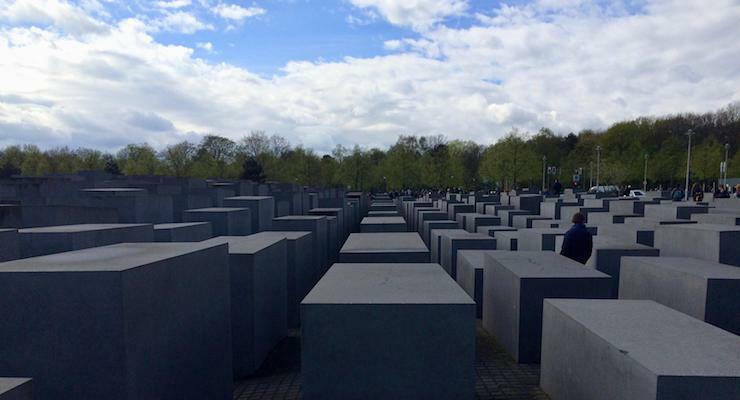 This is a square full of grey, rectangular concrete blocks of varying heights, forming a labyrinth to commemorate the Jews killed by the Nazis during WWII. Below the memorial is an Information Centre, which is free to enter. We queued for an hour to get in to the centre, which has airport-style security. 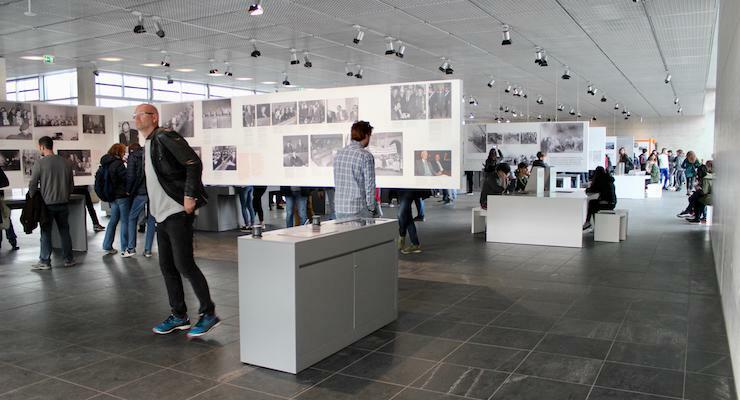 The centre is a very interesting and informative place, with a timeline of the Nazi persecution of Jews, personal histories of affected Jewish families and snapshots of individual experiences from different sources. All of the writing is in both German and English. In one of the rooms brief biographical details of individual victims are read out in both languages. We had lunch at Boussi falafel in the Mall of Berlin Food Court. Mall of Berlin is a huge modern shopping mall with about 270 stores. I had a halloumi pitta and my daughter had a falafel pitta. I’d spotted Gendarmenmarkt on our bus tour and wanted to go there. The square was built in 1688 and is book-ended by the 18th century French and German cathedrals, with the Concert House, built in 1821, between them. It’s a beautiful place, and the sun came out in time for us to take some photos there. Hummus & Friends was our evening dinner spot, a 15-minute walk from our hotel, near to the New Synagogue. The food at Hummus & Friends is kosher and mostly vegan. We shared a main dish of hummus and chickpeas with two pittas, and two side dishes, roast aubergine and roast cauliflower, each served with hummus. It was all very tasty and filling. We were booked on a late afternoon flight to London. We packed and checked out of the hotel after breakfast, leaving our luggage there for later. We took the underground to Kaiser-Wilhelm-Gedächtniskirche, a neo-Romanesque church built in 1895 and bombed in 1943, leaving a ruined shell. Now the west tower has been restored as a ruin, and it contains a Hall of Remembrance showing what the original church was like. The structure is free to enter, as is the 1961 octagonal hall of worship next door, with its blue glass walls which are marvellous to see from the inside. Across the road from here is Bikini Berlin, a very cool concept mall with art installations, eclectic stores and vast windows offering views of the monkeys at Berlin Zoo next door. 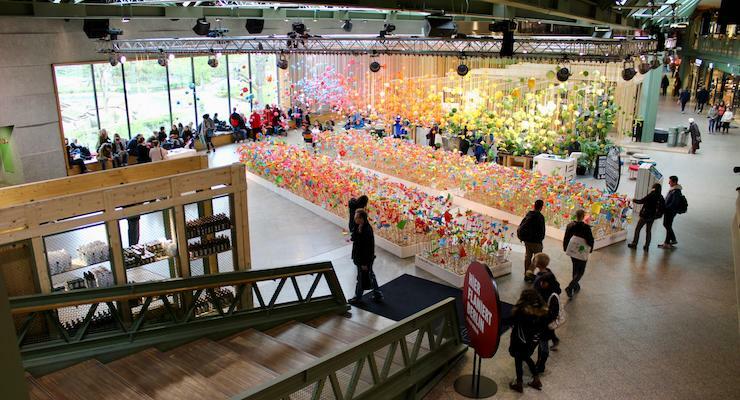 Bikini Berlin also has a roof terrace, and is a relaxing, friendly place to hang out and shop. I’d love to go back and spend longer there. We walked to KaDeWe, five minutes away, hoping to find lunch. KaDeWe is mainland Europe’s biggest department store, and it’s huge. We took the lift to the food halls on the sixth floor and strolled around but couldn’t see any vegan offerings – there were lots of sausages though! We decided to head back towards our hotel and have lunch at Daluma, where we’d eaten lunch on our first day. After lunch we collected our bags and took a train to the airport for our flight home. I say: I loved our trip to Berlin. It was great to go on a city trip with my daughter and I enjoyed following her recommendations. It’s a huge city with a lot to offer, and I’d like to go back there again. The DDR Museum, the Berlin Wall Museum and Bikini Berlin were highlights for me, as well as the food. The hotel worked well for us and I’d recommend it for this type of trip – you can book it here. I always use guidebooks to help me when I travel, and for this trip I used the Lonely Planet Pocket Berlin Travel Guide which my daughter gave me for Mother’s Day, and which I recommend. 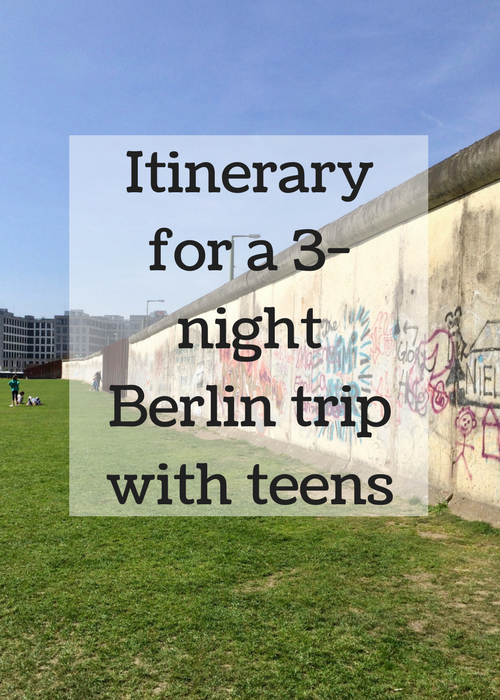 Have you been to Berlin, or would you like to? Is there anything that you’d like to know about our trip? Disclosure: We were provided with Berlin WelcomeCards by the Berlin Tourist Office for our trip. This post contains affiliate links, which means that if you clicked through and booked I may receive a small commission. All opinions, images and words are my own, as ever. Seems you successfully checked in a lot, hah? busy trip. Once upon a time, I was there for few days, almost forget all now except Brandenburg Gate :)) the only thing remember is I had much joy there. You managed to pack so much in, and it must have been good to visit all these thought-provoking sites with your daughter. I love the sound of her restaurant recommendations! A really useful post. Thanks Nell, it was a really good trip. I’m writing a separate post about the places where we ate, as it seems to be such a great city for vegans. 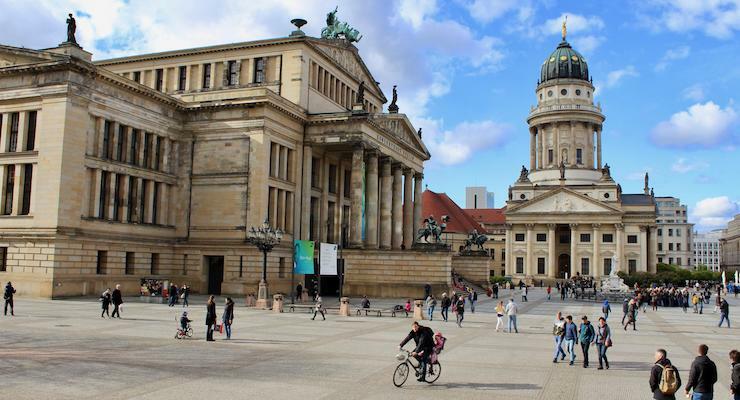 It’s such a long time since I was in Berlin – I’d love to go back and see how It’s changed. This is a great starting point for a short break. Thanks Cathy – there’s so much to do there, I’d like to go back too. That was fab to read, and relevant too, especially from your daughter’s point of view. Shall have to go now. Thanks Helen – there are some great art galleries there too, but we didn’t manage to see any of them.